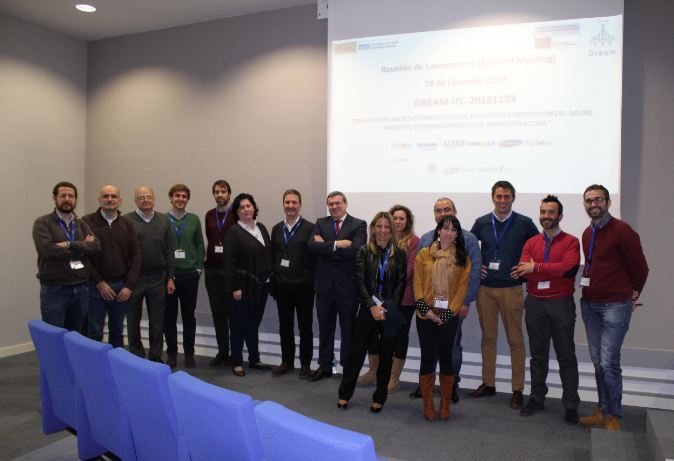 At the beginning of February the spanish I&M project DREAM was released in a kick-off meeting. This project is funded under the FEDER-INTERCONNECTA programme of CDTI and it aims to develop aerial robotic systems for the inspection and maintenance of infrastructures within the civil engineering, the electrical and the petrochemical fields, with to objective of increase and improve the inspection and maintenance tasks. The project consortium exists of spanish enterprises Cemosa, Elimco, Cualicontrol, Alter Technology, Rovimatica and Ingemont, just as the research centres FADA-CATEC, Tecnalia and the University of Seville. Thanks to the results of this project the inspection and maintenance task will become more efficient and safer inside the civil engineering field and the petrochemical and electrical plants. Also, this project is included inside the I&M practical cases of RIMA and in the services of Spanish Robotics DIH.